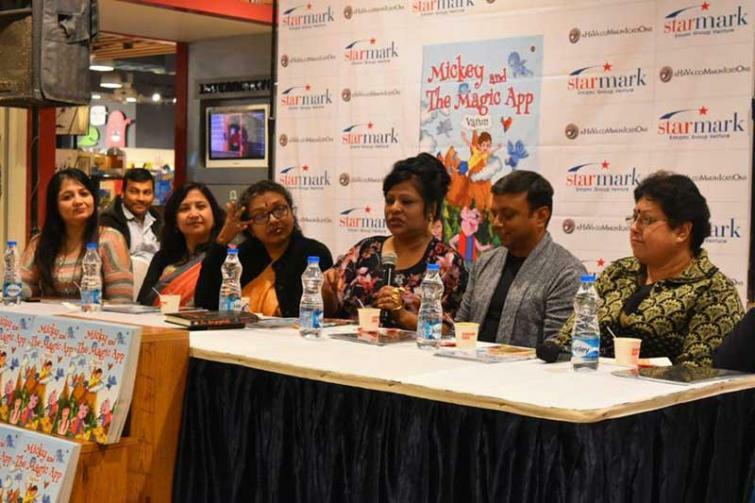 Kolkata, Jan 28 (IBNS): Kolkata’s largest bookstore chain Starmark, in association with Ahava Communications, hosted the launch of Sourabh Mukherjee’s book for children Micky and The Magic App at its Quest Mall outlet here last week. At the launch, which was moderated by Nivedita Bhattacharjee, Persona Founder/ Director, the author was in conversation with Anuradha Das, Principal, Garden High International School, Sunita Sen, Principal, Ballygunge Shikhsha Sadan, Anjana Basu, author, Reetasri Ghosh, leadership development professional, and former Director, Aspen India, and Shubhra Shah Agarwal, author and psychotherapist. Micky is a precocious six-year-old urban child who has to go and stay at Aunt Maggie’s farm when his presents leave for a place called ‘abroad’. While playing with his iPad, Micky stumbles upon a magic app that reveals a fascinating magic world to him. As Oink and Grunt, the two magic pigs, show him around the magic world, Micky decides that this is where his heart belongs. Meanwhile, at Aunt Maggie’s place, Sarah, his cousin, is in deep trouble. Micky resolves to help her with the help of his magic friends. However, he soon finds that to bail Sarah out, he must embark on a fascinating treasure hunt. Sourabh Mukherjee is a serving officer in the Indian Armed Forces. The inspiration to pen down Micky and The Magic App came from narrating stories to his daughters while he tucked them in to bed. Almost every night, there would be requests from his children for a bed-time story, and Sourabh would rack his brains and come up with weird stories that brought spontaneous giggles from them. Micky and The Magic App is one such narration. The 43-year old author, who lives in Shillong, writes under pen-name Varun. Micky and The Magic App has been published by Notion Press, Chennai.